The main campus of Great Basin College campus has been transformed into a high desert oasis during the last decade, well depicted in the GBC Campus Map. 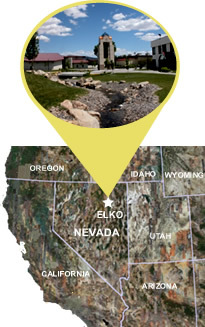 The 44 acre site borders Interstate 80 less than a mile from downtown Elko, Nevada about half way between Reno and Salt Lake City. From the site, collegians may look south and see the snow-mantled Ruby Mountains. A 4.5 million grant project from the Donald W. Reynolds Foundation, completed in June of 2001, has graced the campus with a landmark bell tower, pristine waterway, outdoor amphitheather, glass soliarium, and lovely landscaping. Open computing labs in the Library, High Tech Center, and Academic Success Center. A theater and outdoor amphitheater. 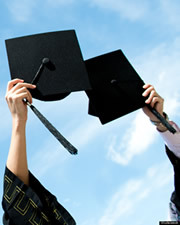 Student housing within walking distance for 18 families and approximately 90 individual students. The Mark H. Dawson Child & Family Center, which offers preschool and extended childcare to students, employees, and the Elko Community. With a regional population of about 40,000, Elko offers many urban amenities while remaining small enough to foster a sense of community. With the Ruby Mountain and Jarbidge wildnerness areas nearby, the region affords abundant outdoor recreational opportunities. Home of the Western Folklife Center, Elko hosts the world-famous annual Cowboy Poetry Gathering in mid-winter. And, home to a large Basque commuity, it also hosts the National Basque Festival in mid-summer. Though the community originated as only a stop on the Central Pacific Railroad, Elko is now the prosperous hub of the continent's richest gold mining region. Its colorful history is richly, and often humorously, documented in Howard Hickson's Histories by the director emeritus of the Norheastern Nevada Museum.